One Fat Frog Restaurant Equipment has Florida’s best and most affordable selection of used commercial restaurant equipment. One Fat Frog Restaurant Equipment has a staggering amount of used commercial restaurant equipment, including both cold line and hot line items. One of the most popular items in the One Fat Frog Restaurant Equipment hot line selection are the variety of used fryers. Fryers are a staple in nearly every kind of restaurant, including bars, vegan restaurants, diners, food trucks, etc. One Fat Frog Restaurant Equipment carries several brands of used fryers including American Range, Tri-Star, Imperial, etc. When purchasing a used fryer, it is important to have some knowledge of the capacities of different fryers. Fryer oil capacities range from 20 to 160 pounds. The types of foods cooked and the peak production demand of your operation determine both the type and size of used fryer needed. The smallest free-standing fryers are the oil-conserving, 30-pound capacity units, which in some cases can cook as much food as can be cooked in a 50-pound fryer. Larger capacity fryers are generally in the 100 pound range. Manufacturers also rate their units based on the number of pounds of french fries they can prepare in an hour. Generally, fryers can produce a volume that is from one and a quarter to one and a half times the weight of the oil they will hold. Thus, a countertop model with an oil capacity of 20 pounds can produce about 30 pounds of fries per hour. HIgh-volume 80 pound units can produce more than 100 pounds of fries per hour. One Fat Frog Restaurant Equipment welcomes quick cash deals and package deals towards the entire stock of used commercial restaurant equipment, including used fryers. One Fat Frog Restaurant Equipment also offers an easy financing plan that anyone can be approved for. Bad credit is not a problem! One Fat Frog Restaurant Equipment offers free delivery to more parts of Florida than any other dealer! One Fat Frog Restaurant Equipment delivers for free to Ocala, Gainesville, Jacksonville, Tampa, St. Augustine, Lake City, and more! 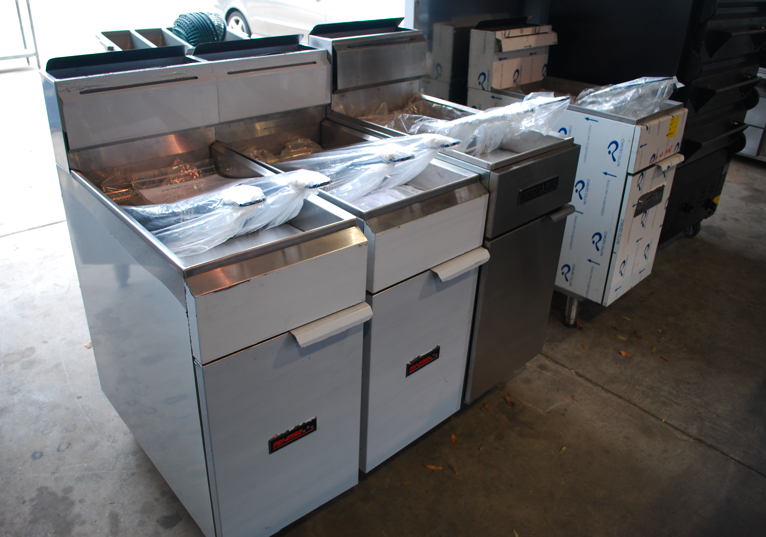 So if you are in the market for a used fryer, come into One Fat Frog Restaurant Equipment today! ← Financing for Start Up Daytona Restaurants, Daytona Food Trucks, Daytona Bakeries, etc.